Last March I had one of the most amazing experiences of my life. I won a place in the a once in a lifetime Olympic Park Run and was one of the first people to cross the finish line in the newly completed Olympic Stadium. Well, the National Lottery are doing it again… with the Anniversary Run on 21 July 2013. And I’ve got a place! I’m going #backtothestadium and I can’t wait because this time I’ll be joined by David. It’s another 5 mile run around the Queen Elizabeth Olympic Park, past the iconic velodrome where Sir Chris Hoy became the most sucessful British Olympian ever, the Copper Box where we discovered that handball is amazing, the Aquatic Centre where Michael Phelps became the person to win most gold medals ever and into the stadium… that stadium where David Rhodesia blasted to the fastest 800m ever, Jessica Ennis powered to gold, Greg Rutherford leapt to glory, Mo Farah had two dream Saturdays to win 5,000m and 10,000m golds and Usain Bolt proved he is the fastest man in the world. Can’t wait. I may not sleep until July! It stuck me that my ‘Unresolved’ post was almost entirely negative. It was all about what I didn’t do in 2012, what I failed to achieve. In March I ran a race with Sally Gunnel, Roger Black and Princess Beatrice around the Olympic Stadium and I beat a guy called Bolt by 2 seconds. It was Andy Bolt from Sheffield… but it makes a great story! 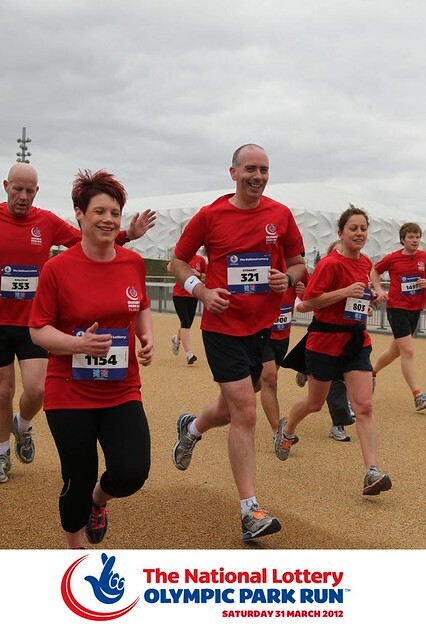 I won one of 5,000 places in a once in a lifetime race around the Olympic Park in London. 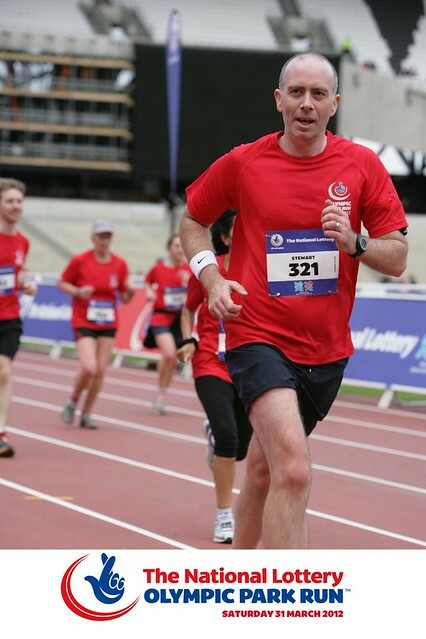 I was part of the first race to finish in the Olympic Stadium and it was amazing. I’ll never forget it. We ran past the now iconic venues of the 2012 Olympic Games and round the tunnel beneath the Olympic Stadium to the strains of the theme from Chariots of Fire. Emerging onto that track was one of the most unbelievable feelings. It still feels like a dream. At the end of May I did battle with the 26.2 miles of the marathon for the first time. It was an outrageously hot day in Edinburgh but I loved the run. It was hard, I had to dig deep, but the sense of community and shared purpose and achievement was something I’ll treasure. I am the 1%… even if I did throw up at the end and loose the nails from my two big toes! I set time goals for both these runs at the start of the year. I decided before the start of both that the time didn’t matter. I wanted to enjoy the runs and see the finish. I had been injured before the Olympic Park Run and it was just too hot to chase a time in Edinburgh. Sometimes the journey is the important thing. Of course the destination is important but every run is made up of each step, not just crossing the line. I’m glad I ditched the times and took my time to savour as much as I could. 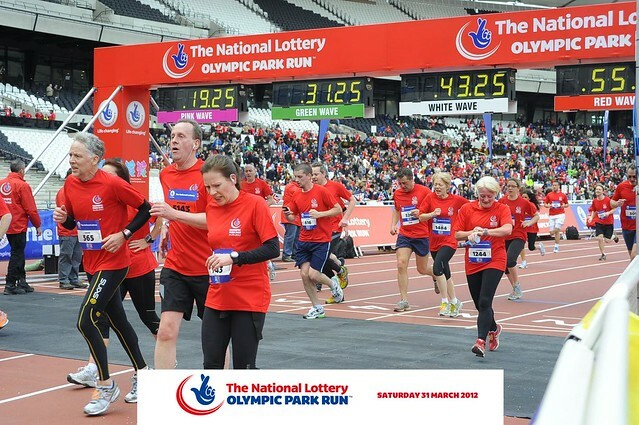 Last year I entered the draw for the National Lottery Olympic Park Run. 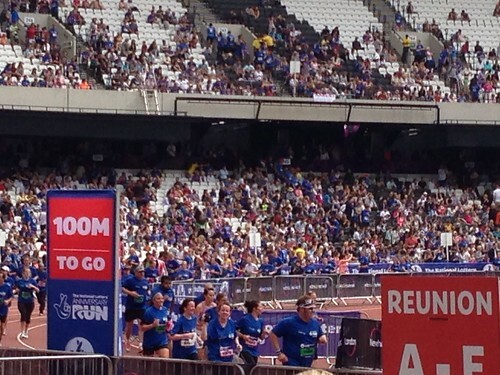 They would pick 5,000 runners from all 40,000 entrants to be the first people to run in the Olympic Stadium. I won a place. I couldn’t believe it. 0730 Time to get up. Yesterday was a long drive from Hamilton to our friends Linda & Denis’ house in Brackley. 6 hours driving is not the best preparation for a run but I was feeling ok. My back was a bit tight but nothing unusual considering the trouble I’ve had with it recently. Great pre-run breakfast of bagels, scrambled egg and smoked salmon (courtesy of chef Linda). One last check of the bag, put on the red race t-shirt and make sure Avril and David have their spectator bands. Parked at Greenford Tube Station a took the central line direct to Stratford. 1230 The entry to the Olympic Park was through the fantastic Westfield shopping centre, the massive new mall right next door. The advice was to arrive early, allowing a couple of hours to clear the airport style security, and as we approached the Olympic Park it looked like would need all of that time. The queues moved quickly though, and despite Avril being directed to a different scanner we were soon reunited and heading into the Olympic Park. 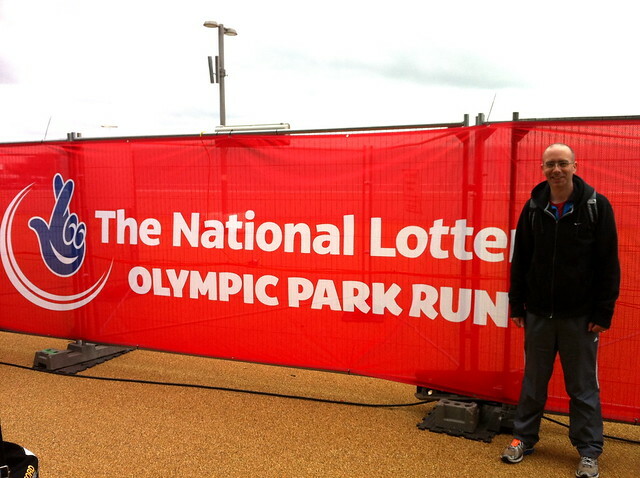 The Olympic Park was dressed head to toe in Olympic Park Run banners and National Lottery logos. It looked amazing. The first buildings in view as you enter the Olympic Park are the Olympic Stadium straight ahead and the Aquatic Centre to the left. As stadiums go the Olympic Stadium is pretty cool. It isn’t a tall or imposing building from the Westfield side but it is distinctive and I like it. You enter the stadium at the concourse level above the lower tier of seating which explains why the stadium doesn’t look very tall. It’s unlike any stadium I’ve every been in. There are no turnstyles and the toilets are built into the outside of the stadium. It is surrounded by small buildings which look like they will be concession stands for the Olympics which makes lots of sense in terms of space. The seats have plenty of space but aren’t very steeply sloped so you feel a little far away from the track and I’m not sure how it would work as a football stadium after the games. The pitch might seem a bit remote, but that’s for another day. Before we go any further I should address the most important matter of the day… it was FREEZING. The wind was whipping round the stadium and the spectators were so cold, a real shock to the system after the great weather of the previous week. 13.30 As I began warming up the sun came out a little and I made the decision to ditch the thermal top and be a big boy and run in just my t-shirt (so glad I did). Bryan Burnett was hosting the start zone, and doing his usual great job of it. It makes such a difference to have someone hosting the start that really understands how a race feels from a runner’s point of view. The big tunes (Moves like Jagger, Barbra Streisand, Firework (someone got Now That's What I Call Running! for Christmas) pumped out to get us pumped up and our warm up was assisted by Mr Motivator off of the 80’s. Then it was race time. 1400 The elite wave is set off by Princess Beatrice and the chief exec of the National Lottery. 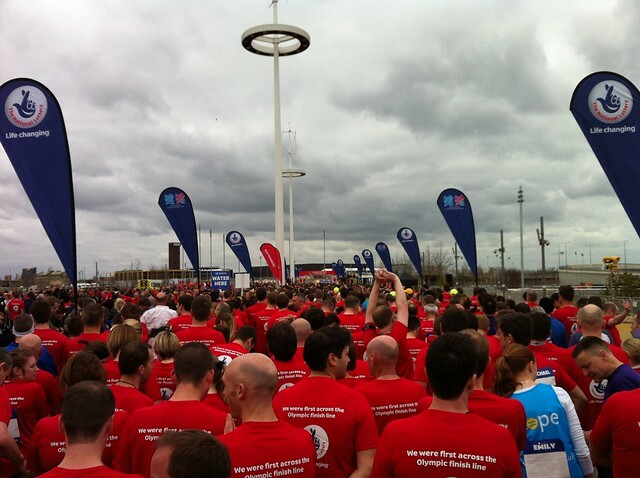 1412 The white (royal – Princess Beatrice was running in it) wave is set off by Olympians Roger Black and Steve Backley. 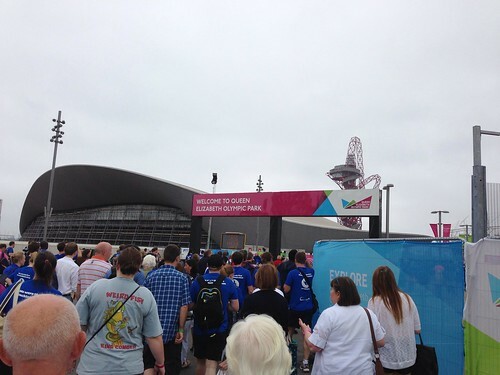 The course wound through the Olympic Park passing the brilliant velodrome, basketball arena, handball courts, copper box, and aquatic centre. Much of the park is still a building site but you can see that in a very short space of time it will be transformed into a place with lots of green open space. I loved the velodrome. It’s by far the best of the buildings. I looks much more permanent than some of the others and is beautifully designed. The BBC’s Nick Hope gives a great runner’s eye view of the run and I’ve added some runner’s youtube videos at the end which give a great sense of running around the tunnel under the stadium and emerging onto the track. There were some pretty steep inclines along the way with a long drag at about 3.5 miles. It was worth the climb though as the top of the hill gave a brilliant view of the stadium, our destination. The highlight of this run was always going to be the finish. This was the first time that members of the public would be given the chance to be first across the Olympic finish line. As we approached the Olympic Stadium I started to get really emotional. I think the realisation that I was about to do something that only a very few people would ever get the chance to do was suddenly very real. 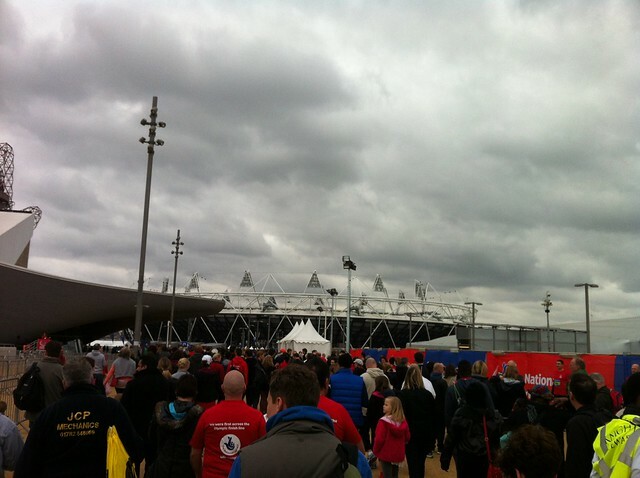 …and I emerged onto the track of the Olympic Stadium. This was a test event. There were only 12,000 spectators but even with that amount of people the atmosphere was brilliant. I decided that the time didn’t matter. It was great that we could take a couple of spectators to witness this unique event. Running is often quite a solitary sport but for most people it’s impossible without someone to support your efforts. I’m in the middle of training for my first marathon. I was injured for most of January and without Avril’s support I’d have given up then. It was really special to have her there to watch. Without really realising it I found myself running down the home straight. It was almost over… and a sub 42 minute time was still on. I turned up the pace, well you have to go for it across the line, and headed for home. What an amazing day. 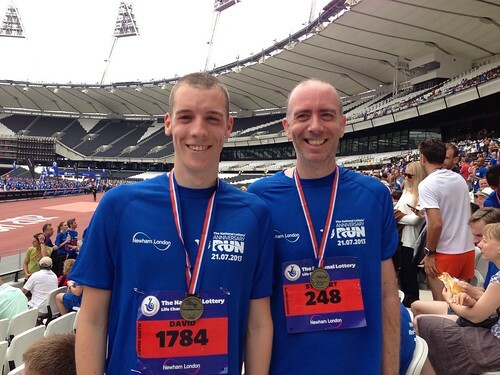 I still can’t quite believe that I spent Saturday afternoon running round the Olympic Stadium. And just in case you are wondering… I beat Princess Beatrice, just. Love the Steve Jones reference in this! 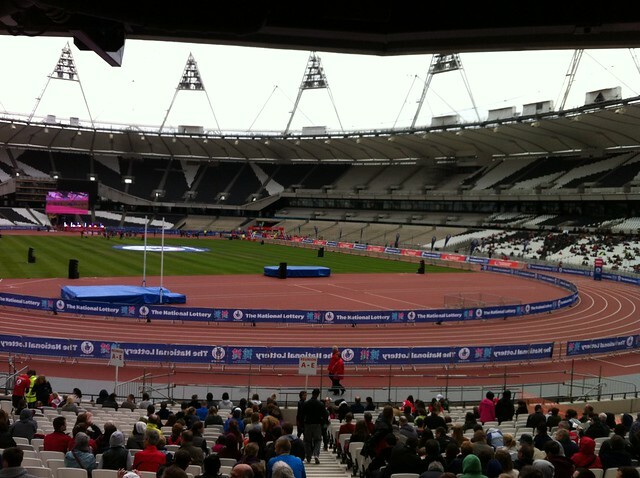 Tomorrow I will join 4,999 runners in the first race to cross the finish line of the London Olympic Stadium. I’m beyond excited. The race will be started by Princess Beatrice and joined by a host of celebrities. Most exciting of all, we will be cheered across the line by 50 Team GB Olympic Athletes. I’ll be tweeting (@stewartcutler) lots and if you want to send good wishes to the runners then tweet with the #olympicparkrun hashtag and your tweet will appear on the big screens inside and outside the stadium. Here’s the route for Saturday’s Olympic Park Run!